Drumming with awareness is a phantastic meditation technique. While learning to drum ancient African rhythms we connect with the timeless dimension in ourselves, let go of our ego boundaries and experience the bliss that comes with being present. 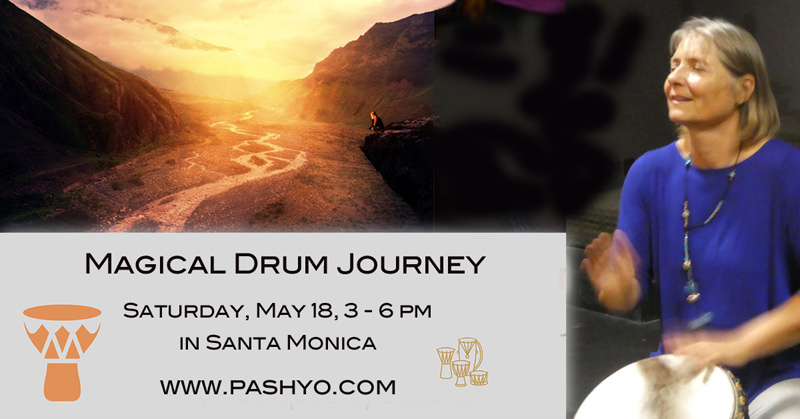 We also get a taste of one of Osho's active meditations, enjoy a no-mind drum circle and dance! Pashyo is a creative spirit expressing herself in various mediums. Her two main passions are music and meditation. She works in the field of music as a dance performer, singer/songwriter and percussionist. She teaches music, dance, percussion and singing to toddlers, kids and adults and leads drum circles with an emphasis on African rhythms. She facilitates Osho meditations and helps people in private sessions to make sense of their lives using tarot, astrology and conscious dream journeys. The workshop is held in a beautiful private location in Santa Monica. Drums will be provided upon request. Join us - drumming is fun!